This impressively modern and stylish 29m yacht has an unusually large and well planned deck space, perfect for entertaining and relaxing. She features four spacious cabins that can comfortably accommodate up to ten guests and has a great selection of water toys. With her wide deck areas, Talila is the ideal yacht for static events (she can host up to 40 guests) or for enjoying the day under the Mediterranean sun. 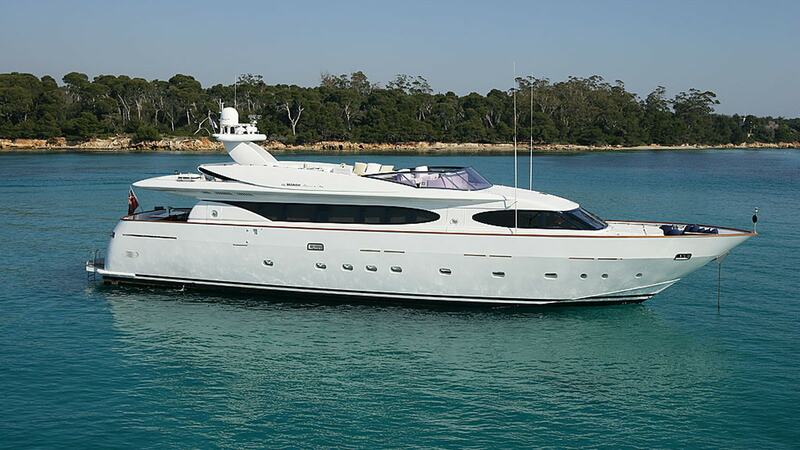 Talila has four cabins that are equally spacious with a slightly larger bath room and seating area in the main cabin. All are elegantly styled with light carpet, darker wood and they also feature state of the art entertainment systems. Her comfortable salon has a large flat screen TV, a DVD player an iPod and surround system. The yacht boasts a great selection of DVDs and music collection onboard. Her large Fly bridge has spacious large cushions perfect for sun bathing as well as big lunch table and smaller bar areas around, making her ideal for entertaining a number of guests. Aft deck and dining table welcomes eight guests in large, comfortable areas. There is also an option of retractable Bimini on the upper deck for guests who wish to be in the shade. Talila has a wide range of toys to choose from including both a wave runner and a jet ski to keep guests occupied during the charter.